* Platform independent - Unlike ActiveX components MyUploader is platform independent. This means that the upload applet also work on a Mac or on a Linux machine. * Web Server independent - MyUploader can transfer files to any web server. It doesn't matter if it's a classic ASP, ASP.NET, Coldfusion, Perl, PHP or a Servlet or JSP based web server. MyUploader can be used with Struts. * Multiple file upload - MyUploader uploads hundreds of files within seconds. All in one request. You just need to select or drag and drop your files and click on the upload button. * Folder upload - MyUploader uploads now entire directories to the server and all the subdirectories. Creating directories manually on the server is past time. 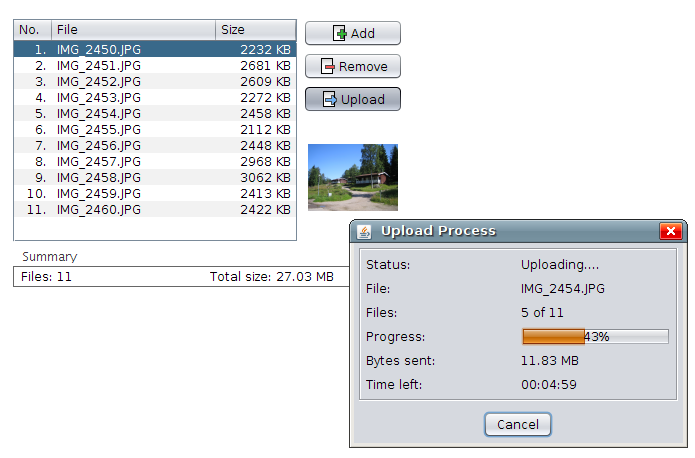 * Progress bar - MyUploader shows during upload an informative progress bar. It tells you everything about the upload process. You can see the time left and much more. Qweas is providing links to MyUploader 1.14 as a courtesy, and makes no representations regarding MyUploader or any other applications or any information related thereto. Any questions, complaints or claims regarding this application MyUploader 1.14 must be directed to the appropriate software vendor. You may click the publisher link of MyUploader on the top of this page to get more details about the vendor.